Get FREE Ensure from Kroger! 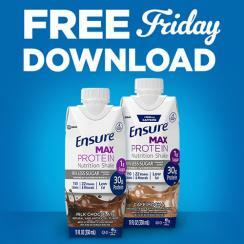 8/10/18 ONLY, download your coupon for 1 FREE Ensure Max Protein Nutrition Shake Single (11 fl. oz., select varieties) from Kroger. Redeem by Sunday, 8/26/18.